Nobody like an aquarium covered in algae. 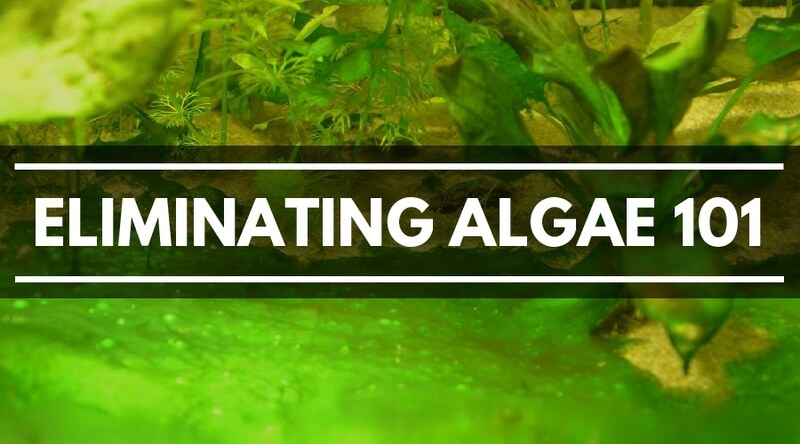 Unfortunately, algae can be very tough to get rid of once it has a stranglehold on your tank. As a result, a lot of aquarium owners turn to algae eaters to help keep their tank clean and healthy. 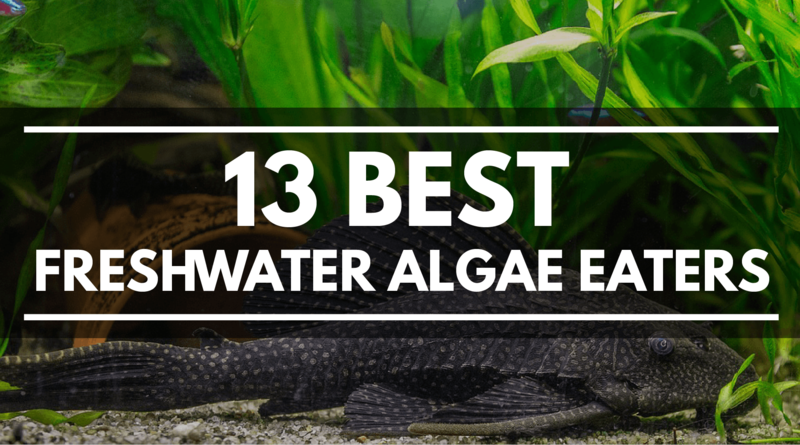 In this guide, we explore a few of the best algae eaters and their care needs. The Bristlenose Pleco is a a great addition to any tank, regardless of whether or not you have an algae problem. That said, they top out our list as one of the best algae eaters because of their small size, huge appetite, and hardy nature. Bristlenose Plecos are one of the smaller species of plecos, topping out at around 5 inches. As a result, a large aquarium isn’t needed. 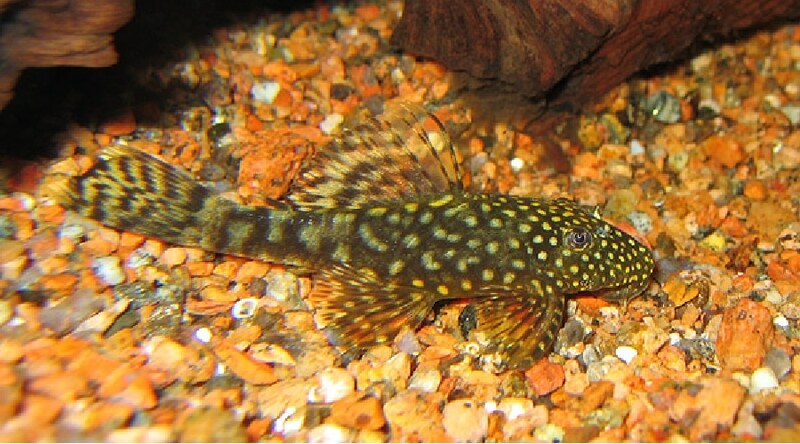 Considering most species of Plecostomus grow upwards of 18″, the Bristlenose is a much better alternative. Bristlenose Plecos also make great algae eaters because they are very well mannered. No matter what you have in the tank, you can be sure that this species won’t cause any problems. Important Tip: Bristlenose Plecos have large appetites, so it is recommended that you feed occasionally with algae wafers to ensure they get enough nutrition. The Otocinclus Catfish, more commonly known as the “Oto” Catfish, is one of the most beloved species in fishkeeping. Takashi Amano, known as one of the most respected aquarists in the world, often houses Oto Catfish in his award winning setups for their peaceful nature and tireless effort. Because of their tiny size (generally around 2″), Oto Cats are the best algae eater for smaller tanks. Their small size allows them to reach spots that Plecos simply couldn’t fit. Otos Cats make great additions to any planted tank, but shouldn’t be kept with large, aggressive species considering their small size. In addition, they prefer to be kept in small schools of 3-5 fish. Overall, Otos are definitely one of our top recommendations. Black Mollies generally aren’t looked at as being “algae eaters”, but they can do an amazing job at cleaning up a messy tank. Mollies tend to do a great job with hair algae in particular. If Plecos or snails are a little boring for your taste, this active species is a great alternative. 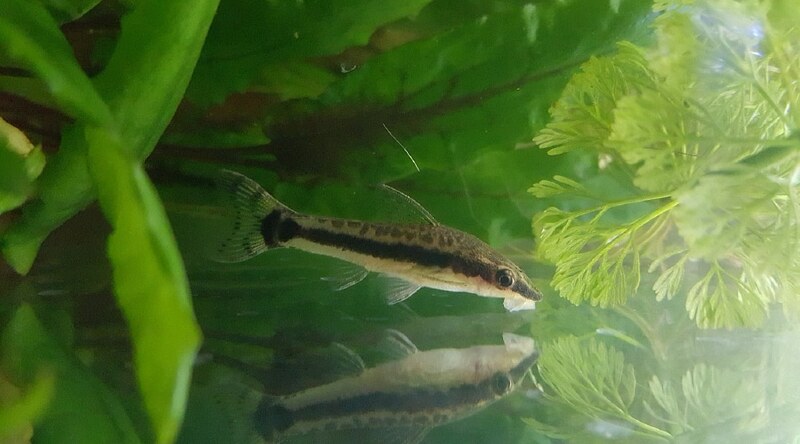 Another nice aspect of Black Mollies is their tendency to reproduce quickly. Two Mollies can turn in to a few dozen within months, so their algae-eating power can really be intensified quickly. Mollies probably won’t consume as much algae as other species on our list, but they make a great addition to any community tank that just needs a little cleanup. 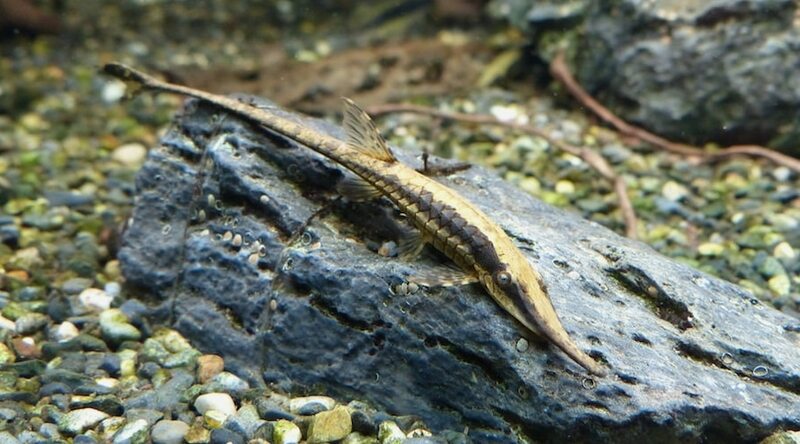 Twig Catfish (also known as Whiptail Catfish) are a delicate species with a big appetite for algae. Maxing out at around 6 inches, the Twig Catfish makes for a great, interesting addition to any peaceful community aquarium. Twig Catfish naturally thrive in habitats with good water flow, aeration, and lots of live plants. As a result, this species is common among planted aquarium enthusiasts. Since this species is a little more sensitive to water changes than others on our list, try to keep your water levels as consistent as possible. Try to avoid any aggressive tank mates such as cichlids, or fish such as Barbs that tend to nip at fins. Garra (also known as doctor fish) have gained popularity over the last few years for their role in spa treatments. That said, Garra are much happier feeding on algae than dead skin! 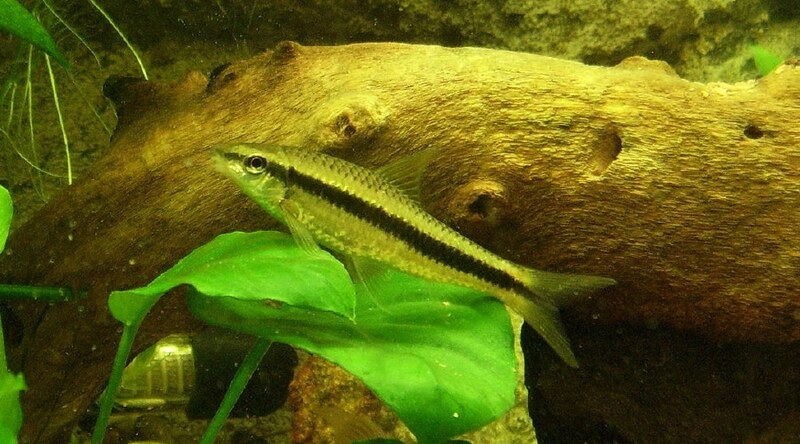 Garra are native to fast flowing, highly oxygenated streams in Indonesia. If you are planning to keep this species, a strong filter or powerhead is necessary to recreate the strong water flow of their home environment. Though Garra do a great job at cleaning up algae-filled aquariums, they should always be fed a balanced diet. Supplemental feedings of bloodworms, algae flakes, or algae wafers will help keep your Garra healthy and happy. 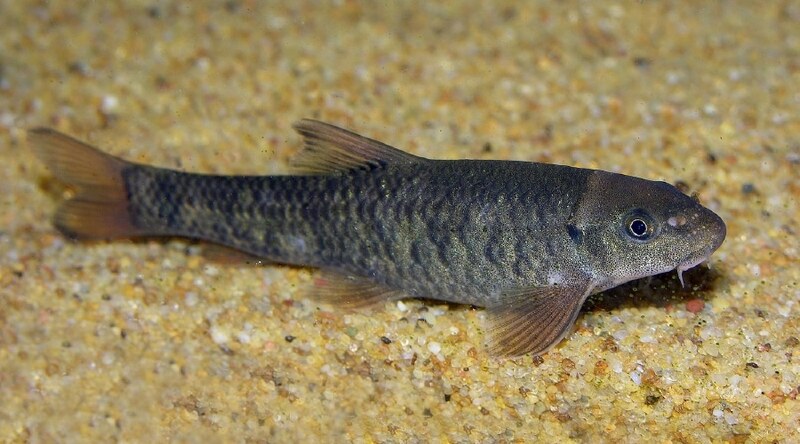 Based purely on effectiveness, the Siamese Algae Eater is definitely one of the best algae eaters on our list. Their small size, mild temperament, and unending appetite for algae makes them the perfect choice for many home fish-keepers. Though they are eager to feast on any type of algae, Siamese Algae Eaters are commonly known to clean black algae faster than any other species out there. A group of 4-5 of these fish can leave an algae-covered tank sparkling clean in just a few days. Siamese Algae Eaters are also a great choice for planted aquariums. They do an amazing job at ridding live plants of algae without damaging the plants themselves, which is a very hard trait to find. Overall, Siamese Algae Eaters are high energy, active fish that can clear a tank full of algae faster then any of species out there. Of all the algae eating shrimp on our list, the Aman0 Shrimp is definitely the powerhouse. They have a much larger appetite for algae than the other species on our list and do best when kept in groups of five or more. Amano Shrimp, named after award winning aquarist Takashi Amano, are a “large” species of freshwater shrimp (around 2″). As a result, they tend to consume much more algae than smaller species and are easier to keep with fish. That said, predatory fish should obviously be avoided. 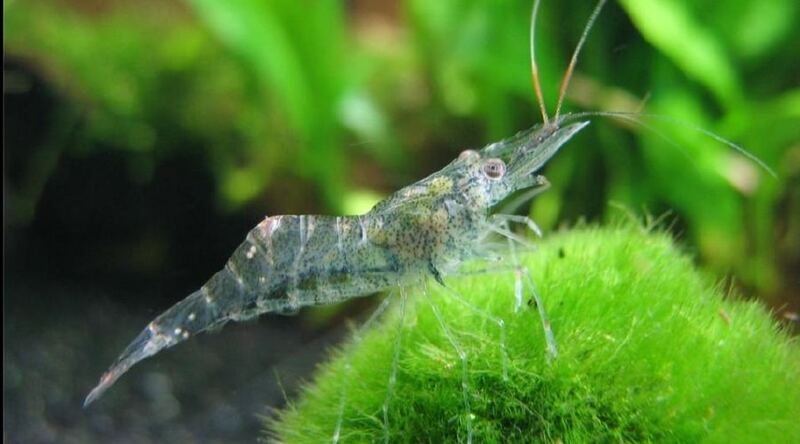 If you plan to keep algae eating shrimp, Amanos are definitely your best option. Ghost Shrimp aren’t usually viewed as algae eaters. 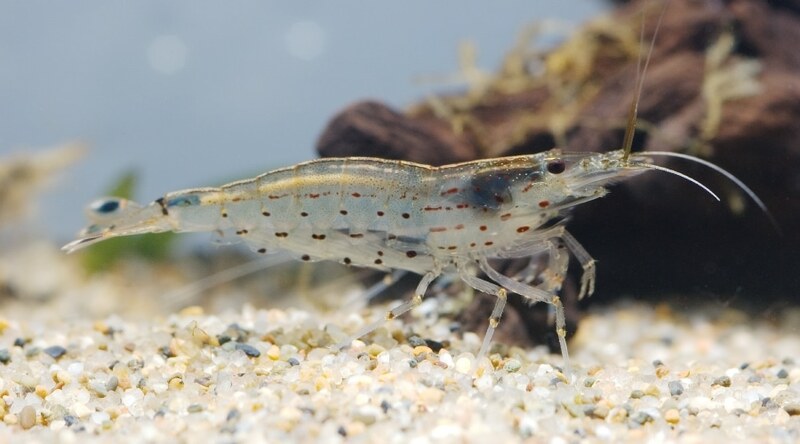 In fact, most fish-keepers buy ghost shrimp as food for their fish because they are nutritious and extremely cheap. That said, Ghost Shrimp can be a great addition to planted tanks if you don’t plan to keep any larger fish. While Ghost Shrimp aren’t as effective at removing algae as Cherry or Amana Shrimp, it definitely won’t hurt to throw a few in your tank. Their clear bodies and tiny size make for an interesting addition, especially since they cost next to nothing. The most visually striking algae-eating shrimp on our list is definitely the cherry shrimp. Their bright red appearance adds great color to any tank, especially planted aquariums that are often overrun with green. Cherry shrimp not only enjoy feasting on growing algae, but they also help prevent the growth of new algae. As scavengers, Cherry shrimp eat any excess pellets or flakes that fall to the bottom before they have the chance to decompose. This, along with their small bio-load, ultimately helps cut down on the amount of dissolved organics in the tank. 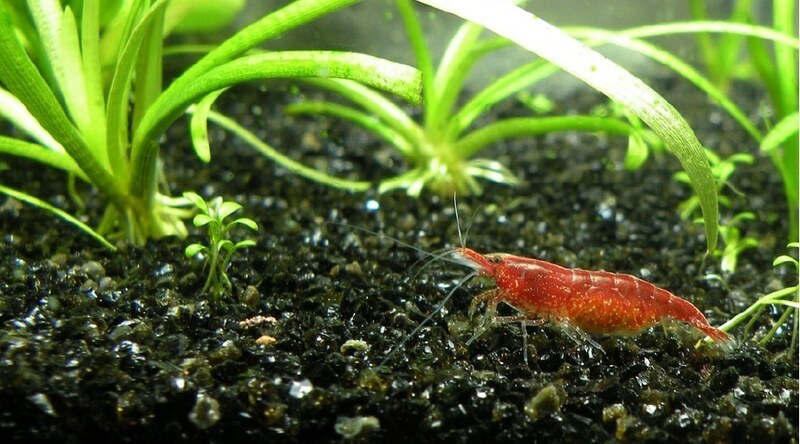 In addition to being great algae eaters and scavengers, Cherry shrimp are also easy to breed. Like most shrimp, small Cherry shrimp should be fine if kept with non-predatory fish. Though small, Malaysian Trumpet Snails make great algae eaters for several reasons. First and foremost, Trumpet Snails are known to feed on debris both on and under the surface. Their ability to dig underneath the substrate and get to uneaten food put them a step ahead of most other algae eaters. Additionally, Trumpet Snails are a great choice for planted aquariums. Not only do they leave plants undamaged and unharmed, but their digging also helps aerate the substrate (which is very beneficial for plant growth). Nerite Snails are definitely the most popular choice when it comes to algae eating snails. Their interesting patterns, large appetites, and hardy nature make them a great option for many aquarium owners. Interestingly, Nerite Snails can thrive in both freshwater and saltwater tanks. 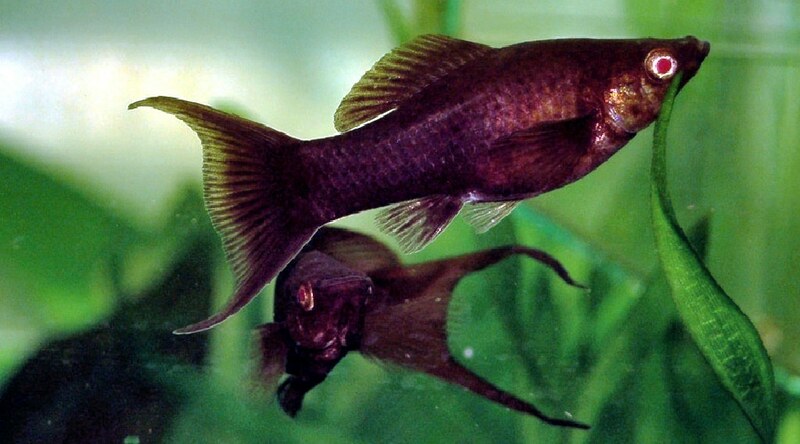 That said, they require salt water to reproduce, which makes them unable to breed in freshwater aquariums. This is usually seen as beneficial, since many types of snails tend to breed quickly and overrun aquariums. 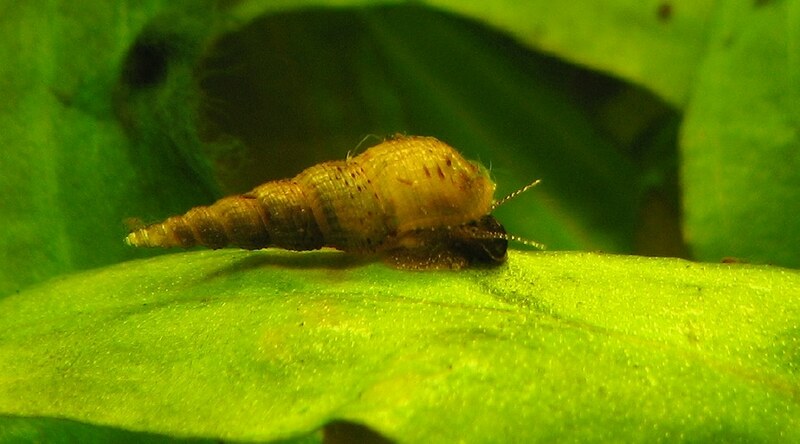 In addition to being one of the best algae eaters out there, Nerite Snails are are also 100% plant safe, making them a common choice for planted aquarium owners. Mystery Apple Snails are, by far, the largest species of snail on our list. 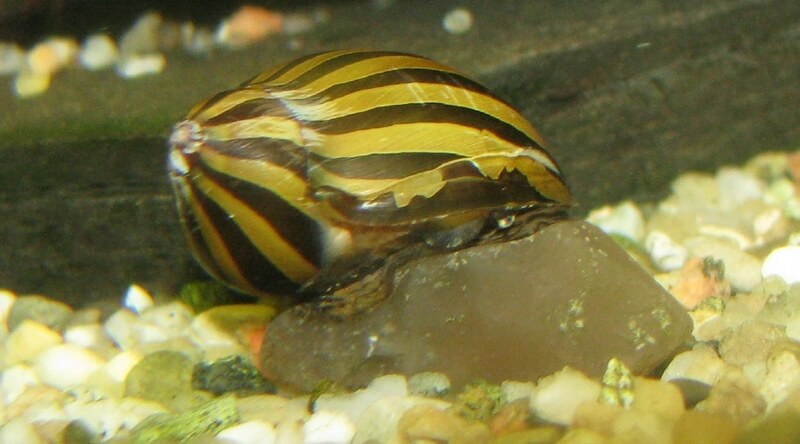 In fact, there are some reports of Apple Snails growing larger than a baseball in home aquariums. Because of their large size, Apple Snails tend to do a great job a plowing throw algae. That said, they also tend to feed on certain aquarium plants. If you have a planted aquarium, these definitely aren’t the best choice for you. 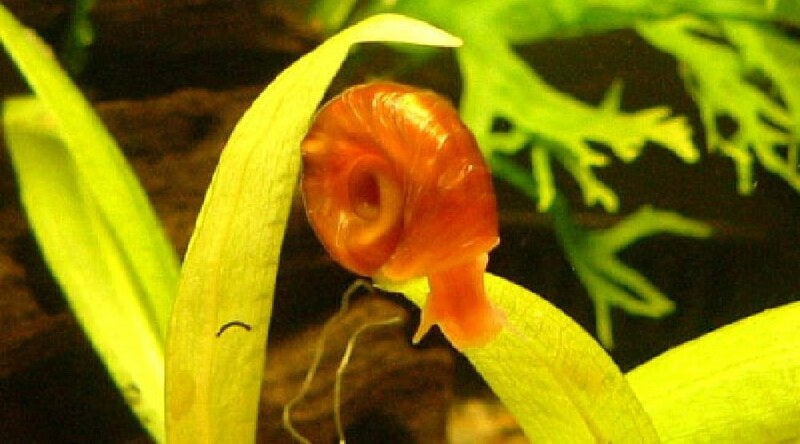 If you don’t plan to keep any plants, Apple Snails are an interesting addition that can do a great job at cleaning up algae. While some people look at Ramhorn Snails as pests (they often hitchhike their way into aquariums through plants), they are actually very beneficial to most aquariums. Ramhorn snails do a great job at cleaning up uneaten food, debris, and dead plants before they get a chance to decompose. In addition, they are 100% safe to keep with live plants. 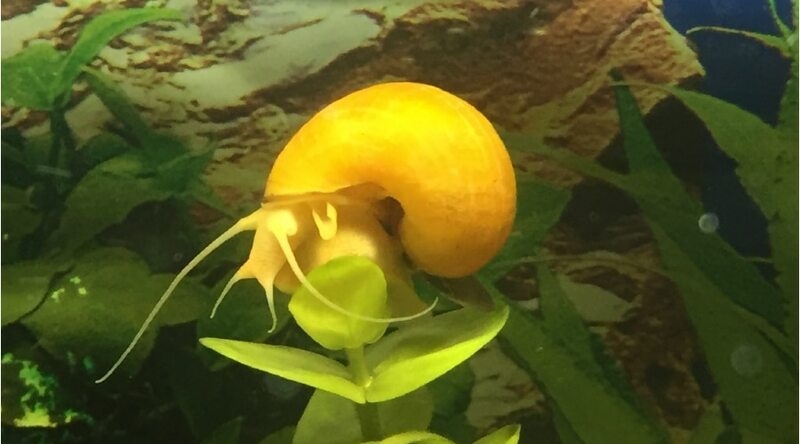 Ramhorns sometimes get a bad rep because aquarium owners find them eating plant leaves, but in reality they ONLY touch pieces that have already fallen off the plant. Don’t get me wrong, feeding your fish is definitely one of the most enjoyable parts of the hobby. It is tempting to feed them multiple times a day. That said, the most common reason (by far) for algae growth is excess feeding. Uneaten food doesn’t really get sucked up by the filter as much as you would think. Instead, it sinks down to the bottom of your tank and rots. This uneaten food then converts into dissolved organics, which is basically the equivalent of lighter fluid for algae. Most people don’t know that fish are completely fine eating every other day. If you notice a lot of algae growth in your tank, try cutting back feedings and see if it makes a difference. Automatic fish feeders can really help control portions and make the process more regular. Water changes definitely aren’t fun, thats for sure. That said, they are definitely a necessary part of the hobby. Water changes not only help remove toxins and dissolved organics that pass through the filter, but they also help replace beneficial trace elements that are vital to the health of fish and plants. Aim to change out around 20% of your tank’s water every other week. If you can do it weekly you will probably see better results, but bi-weekly usually works just fine for small bio-loads. Aquarium vacuums make the entire water changing process much easier. Sometimes excess algae growth can simply be caused by too much light. For non-planted tanks, this problem is pretty easy to solve. In fact, you can cut out the lights all together with no real downside. If you really enjoy the look of a light, only leave it on for a few hours a day. For planted tanks, it gets a little more complicated. I like to run my light 10-12 hours per day in all my planted setups. If I notice algae growth, I try to cut it back by a few hours (especially if I am keeping low light plants). Every tank is unique, so you might have to test out some cycles to find the right balance of plant growth and algae growth. As aquarium bulbs age, the spectrum of light being emitted changes. Though this isn’t obvious to the naked eye, lower spectrum light makes a huge difference when it comes to plant growth. Unfortunately, this spectrum change can fuel the growth of unwanted algae. Depending on your type of light, it may be necessary to change your bulbs up to once per year (mostly with PC or T5 lights). I highly recommend using LED lights, which rarely have to be replaced (if ever). A good LED fixture can run for years without replacement. The NICREW Classic LED is a great, low cost option. This probably goes without saying, but filtration is very important in any freshwater setup. The general rule is that your filter should process around 4 times the total tank volume per hour. For example, if your tank is 25 gallons, your filter should process 100 GPH. For freshwater tanks under 50 gallons, a hang-on-back filter is usually fine (as long as your bio-load isn’t too large). I always recommend the AquaClear Power Filter. For freshwater tanks over 50 gallons, a canister filter is your best bet. The EHEIM Classic has a great reputation and is hard to beat in terms of quality and performance, especially for the price. So…what species is actually considered the best algae eater? As we can tell from the summaries above, this question isn’t so black and white. Choosing the best algae eater requires you to assess the specific needs of your tank. Regardless, all of the species above should do a great job at cleaning up even the messiest aquariums. Pick whichever species fits your needs the best and enjoy a cleaner tank!